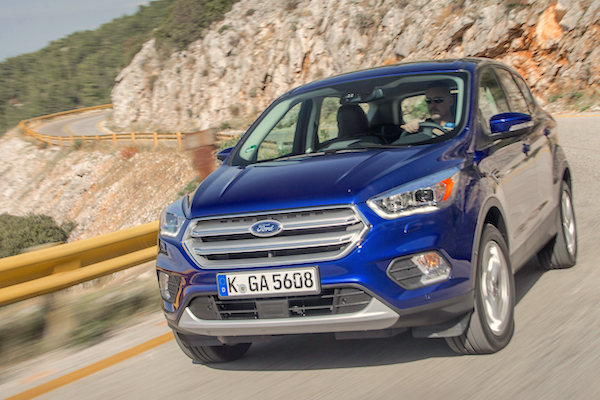 Ford Kuga sales are up 34% year-on-year in Switzerland in March. March sales down 7.8% to 28.126 registrations pull the Swiss year-to-date volume into negative territory at -0.9% and 72.089 units. However 4×4 sales behave better than the market once again with a slim 1.7% drop to 13.826 sales or 49.2% share vs. 46.1% a year ago. Q1 4×4 volumes are up 4.3% to 35.513 and 49.3% share vs. 46.8% over the same period in 2017. Despite a steep 16% year-on-year fall, Volkswagen manages to reclaim the brands top spot after a historical win by Mercedes last month, itself down 2%. BMW (-6%), Skoda (-8%) and Audi (-15%) complete a Top 5 entirely in negative. Volvo (+23%), Ford (+17%) and Dacia (+9%) are the only brands to gain ground in the Top 15. Further down, Ferrari (+128%), Cadillac (+127%), Lamborghini (+42%), Kia (+38%), Jeep (+35%), Mitsubishi (+31%), Ssangyong (+31%), Mini (+29%), Citroen (+13%) defy the odds with double-digit gains while Alpine makes its (re)appearance with its first 2 sales in Switzerland. Despite hefty drops, the Skoda Octavia (-23%) and VW Golf (-31%) remain in control of the models ranking with the VW Tiguan (+1%) rounding up the podium like in 2017 and so far in 2017. The Mercedes GLC (+23%) and Ford Kuga (+34%) complete the Top 5 and point by far the largest gains in the Top 10. Below, the Mini Countryman (+129%), Mercedes GLA (+91%), Audi Q5 (+90%), Suzuki Swift (+73%), Peugeot 3008 (+65%), Volvo XC60 (+46%) and Ford Focus (+36%) impress. There are three recent launches (<12 months) inside the Top 50: the Skoda Karoq at #35 (-8), VW T-Roc at #36 (+21) and Hyundai Kona at #50 (+6). Full March 2018 Top 50 All-brands and Top 340 All-models below.